Daniela Pisano graduated from Milan Giuseppe Verdi Conservatory of Milan with Marlaena Kessick , then perfected in Vienna with Wolfgang Schulz and Paris with Patrick Gallois, J.Pierre Rampal e JL Beaumadier for piccolo. She won international competitions in Stresa, Rome, Belveglio and won the First Prize of the Cziffra Foundation. Flautist of the orchestra of the European Community ( ECYO ) under the direction of Claudio Abbado, the orchestra ” i Pomeriggi Musicali ” in Milan and orchestra ” Soloists of Versailles” Daniela Pisano gave many concerts as soloist and chamber musician in France , Italy, Belgium , Switzerland, Germany , the former Yugoslavia , Romania and USA. 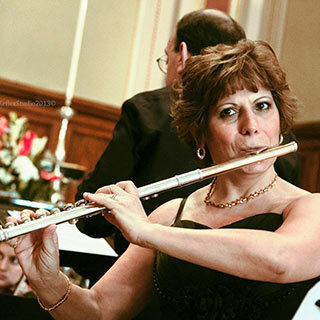 She is solo flautist of “orchestra italiana di flauti”, musical director of the Festival Opera Barga in Italy , and Artistic director of Stage Eurydice Ensemble founded in 1989 in Paris and with whom she gave many concerts. And with which she recorded for RIFI , Rusty Classica , Tirreno , Concerts Artists, RAI TV, Radio France , Swiss Italian Radio and Romanian TV. Since 1985 professor at the European Conservatory of Music in Paris, Daniela Pisano is since 1996 professor at the Conservatory ” S.Rachmaninoff ” of Paris.